Getting on and up the property ladder may be easier than buyers think thanks to the government’s Help to Buy scheme now being available at Newland Homes’ Newland Gardens development in Cheltenham. 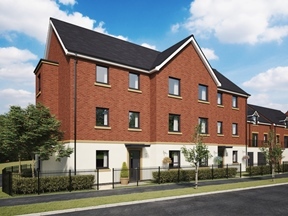 Newland Gardens is a collection of 34 two, three and four bedroom homes designed for first time buyers and those looking to move up the property ladder. Newland Homes is well-known in the area for building high quality, high specification homes. Newland Gardens is the continuation of the regeneration of parts of Springbank by Newland Homes, building on the success of Newland Park which was completed around 2005. Set on the site of the former Springbank Shopping Centre, which had been empty and a target for vandals for almost ten years, the development has been hailed by Cheltenham’s MP and local councilors as a positive move for Springbank that would regenerate and move the area forward. With a selection of two bedroom apartments available from £170,000 and Help to Buy available, buyers who qualify would need to obtain a mortgage of £127,500 in addition to their 5% deposit to fund their purchase. The development has been designed to echo the Regency details that feature in homes across Cheltenham, whilst also providing modern living space suitable for first time buyers and growing families alike. With the town centre approximately two to three miles away, purchasers can strike a balance between the Cheltenham lifestyle and a good value home. The two bedroom apartments, built as two apartment buildings the Montpellier and the Pittville, feature contemporary open plan lounge, dining and kitchen, plus master bedroom with built in wardrobe and private allocated parking space. Select apartments also have an en-suite to the master bedroom, Juliet balconies or private entrances. Gail Remnant, Associate Sales Director for Newland Homes, explained: “We’re pleased to have returned to the Springbank area and to be able to offer these properties to Cheltenham’s buyers. Since we first came to Springbank in the early 2000s the area has improved immensely and now even more so with the regeneration of the former shopping centre. Springbank was called Cheltenham’s ‘Grot Spot’ by MP Alex Chalk but with these new homes we hope to make it an area people want to live and invest in again. For more information on Newland Gardens, click here or call 01242 300347.